I first heard that Ricardo Padilla and Javier Hernandez in association with ASMJC and Dr Theresa Rojas were bringing the Latino Comic Expo to Modesto back in November and have been excited ever since. Taking place at Modesto Junior College Mary Stuart Rogers Student Center on West Campus, 2201 Blue Gum Avenue, Modesto on March 15 and 16th doors open at 11 am you will not want to miss this great event. Co-Founded by Ricardo Padilla and Javier Hernandez in 2011, the Latino Comics Expo is the nation’s first convention dedicated exclusively to promoting and highlighting the contributions of Latino creators (both in the U.S and beyond it’s borders) in the fields of comic books, graphic novels, comic strips, political cartoons, zines, animation and related popular arts. With 8 previous shows ranging from San Francisco, Los Angeles and Brownsville, TX, and an expansion into an annual Latino Animation Festival, the LCX is the premier resource for fans to meet and support the Latino creators of today and tomorrow. The creator of Homies, David Gonzales will be attending along with several other guests. Artist Jaime Hernandez co-creator of the indie comic Love & Rockets whose characters are complex and feel real, right out of SoCal Punk and Lowrider culture. Author/Artist Cathy Camper writer of the Graphic Novel Lowriders in Space and Lowriders Blast from the Past. Professor and Author Fredrick Aldama He is the author, co-author, and editor of 36 books, including the award-winning Laatinx Superheroes in Mainstream Comics. Sonambulo creator Raffael Navarro, Happy Tree Friends co-creator Rhode Montijo, Cartoonist Jaime Crespo, and Zine creators Isabel Ann Castro and Natasha Hernandez are just a few of the creators that will be joining the Latin Comic Expo. 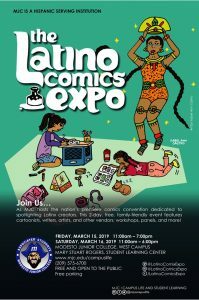 Friday features panels on Latina Power, Lucha Libre comics, Tales from La Vida, Comics in the Classroom & a spotlight on Jaime Hernandez (LOVE AND ROCKETS)! Saturday highlights include a spotlight on HOMIES creator David Gonzales, a zine making a workshop with Cathy Camper (Lowriders in Space) and Isabel Ann Castro (St. Sucia), a “Para Los Niños”children’s book panel and a spotlight on SONAMBULO creator Rafael Navarro! 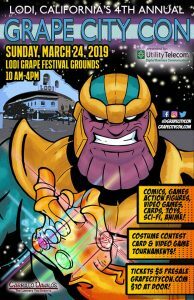 On Sunday, March 24th 10 am-4 pm, don’t miss Grape City Con at the Grape Festival Grounds, Lodi CA. Grape City is one of the best one day Cons in Northern California and is a fan favorite for many. The event will again feature over 150 exhibitors and artists, with more than 40,000 square feet of exhibitors, artists, panels and gaming. Some of the guests announced already are VA Shannon Farnon best known as the voice of Wonder Woman on the Super Friends and Chris Anthony the original voice of Barbie. The Costume Contest will take place in Jackson Hall at 4pm. A portion of the proceeds from the Grape City Con will benefit the Salvation Army Lodi and United Way of San Joaquin. Pro Wrestling Bushido will again hold an afternoon wrestling show just outside the main halls.